As mentioned on my RESOURCES page, Bryanna Clark Grogan is one of the most creative vegan cooks out there! This creation is proof positive!! The flavor of this parmesan is wonderfully complex, just like the kind that needs a cow to be involved. The texture is varied as well ... with bits of crunchy portions interspersed with softer bits. The recipe does call for a couple of unusual ingredients ... dried okara and dried miso powder. If you make your own soymilk or your own tofu, coming by okara is no problem (what to do with it is the usual problem!). As you'll see below, drying it is really quite easy. The only drawback is you have to plan ahead on this recipe, to get the okara and miso dried and available. 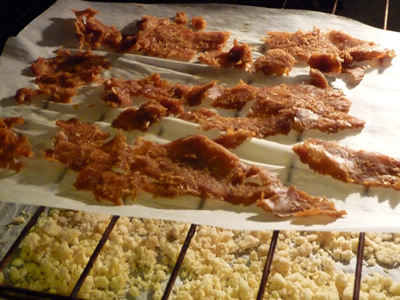 Every time I made soymilk and/or tofu, I just plopped all the okara on some parchment paper and zipped it into the oven for a few hours to dry (see pictures, below). When dried and cool, I just stored it in an airtight jar on the counter. When I had enough, I made the recipe itself .... that part took only a few minutes. Now that I've got the first batch made (it makes A LOT --- 4 cups), I should have enough dried okara by the time I need to make another batch, since I am drying okara routinely now, whenever I make soymilk. See Bryanna's blog entry where she shared this recipe. 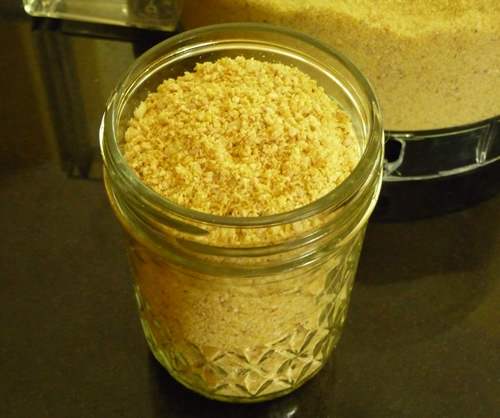 Process all of the ingredients in a dry food processor until it looks about the consistency of parmesan. You don't want a powder-- you want a little texture. You can use a DRY blender, but you'll have to watch the texture closely. Brenda's notes: I increased the amount of dried miso powder from 2 Tablespoons to 3 Tablespoons. I used the slivered almonds option, and lightly toasted them. Bryanna recommends drying the whole container of miso while you're at it, and she's right ... I did just half a container, but the flavor of this dried product is so unique and wonderful, that I see myself adding it to all sorts of dishes! I do not have a food dehydrator, and I wasn't sure how well an oven would do, but it turns out the oven does just fine. As soon as you make a batch of soymilk, just dump all the wet okara out onto some parchment paper, spread it out with your hands, and put the parchment directly onto the oven shelf. 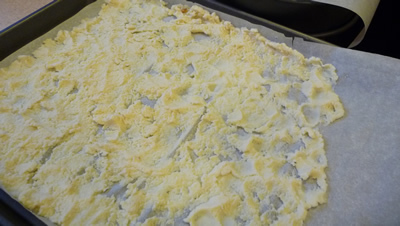 I had first tried this by putting the parchment on cookie sheets (see first photo, below), but all that did was trap the moisture between the cookie sheet and parchment paper. By putting the parchment directly onto the oven rack, the warm oven air can circulate all around, removing the moisture. If you have a convection oven, that will work perfectly since the fan blows the air around in the oven, helping remove the moisture. But a regular oven will work fine also. Bryanna mentions leaving the oven door ajar slightly to allow the moisture to escape. I did not have to do that with my convection oven, since it is designed to have moisture escape through a little opening above the door (I see steam coming out for the first hour or so that this is drying). Set the oven to the lowest setting (mine went as low at 170°, which I thought would be too high, but worked just fine). It takes 4 to 5 hours to totally dry .... after the first couple hours, take the parchment sheet out, and using a flat edged spatula, scrape the okara and miso off the parchment, and break it up. With your hands, spread it all back out again and return it to the oven. The picture above (with the okara in the oven underneath the miso) shows what the okara looks like after this step. As it gets close to being very dry, take it out of the oven again, set it on the counter to cool, and when cool, grind it up in a small spice grinder or a similar appliance to turn it into a powder. See this video. I use the attachment that came with my stick blender to do this -- shown to the right -- a mini food processor thing-y. You'll notice there is still moisture present, and so just return the okara and/or miso powder back to the parchment sheet, spread it out, and give it another hour or so in the oven. This last drying period is the only time you really have to watch it closely. I had one batch of okara that started browning on me because I forgot about it in the oven! If you don't have a full 4-5 hours at one time to do this, it can be broken up. I found a lot of days I'd be making milk in the late afternoon or evening, and so start the okara drying for a couple hours. When I went to bed, I'd just take the parchment out of the oven, lay it on the counter, and then in the morning, resume the drying process in the oven. 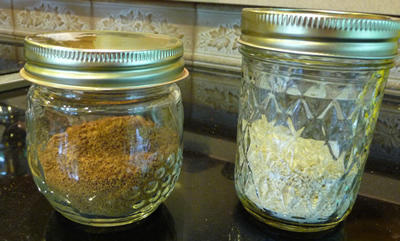 Once the miso and okara is totally dry, store in an airtight jar on your counter.